We found the Franklin Sensors ProSensor 710 to be the best stud finder for most people. What makes it great it is dielectric constant functionality and 13 LED lights that illuminate, all at once, to compare data. The impressive visual display and ergonomically soft plastic handle make all the difference. It is a rectangular-shaped and battery-powered model with a smooth plastic finish. The Advanced Multi-Sense technology offers accurate performance in all locations. The density of detection of this stud finder is so effective that the bright LEDs light up indicating the exact position of the studs. So you know how to visualize and locate them easily. You need the Seek Thermal Compact Imager for same the reason you a professional stud finder. Even though this product isn’t specifically designed for locating studs. It has its practical and effective uses in finding them better than most stud finders on the market. You can see steel studs through a drywall as it houses the best resolution for them. This is an accurate imaging finder that you can attach to your iPhone or Android phone. If you need to highlight areas in your home to know where improvement is needed, this one is best for about a year of consistent use. 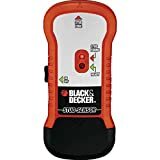 Looking for a dirt-cheap and practical stud finder? 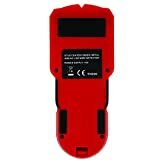 Go for the CH Hanson 03040 Magnetic Stud Finder. This one is a magnetic model which means it finds the exact location of studs with 2 distinct, yet accurate levels of marking. The body of this product is so easy to hold and it fits comfortably in the pocket. You don’t need a separate pouch for this finder as you can carry it around in your wallet or pocket all day long. And on the plus side, this finder hangs hands-free on the wall, all thanks to the powerful rare magnets attached in it. A stud finder is also known as a stud detector or a sensor. This handheld finder can be traced back to the early 20th century, where construction workers relied on magnetic forces to find studs attached in walls. The first similar kind of technology invented was designed for measuring the change in density behind walls. Zircon Corporation soon took this invention under its wings. However, that patent didn’t last for long. The reason being they weren’t effective enough to detect and measure the density of the studs through walls. However, since that time there has been many improvements in both design and functionality. Now stud finders come with multiple sensor plates that are positioned across the wall for effective detection. Similarly, you will also find detectors that locate studs in multiple places by illuminating a bright red light or a sound. These sensors can measure the depth, width, and presence of studs immediately. If you want more sensors, you’re less likely to feel compelled to manually calibrate the finder for instant reading. Newer models of detectors adapt to their environment, in this case different types of wallings, to find studs efficiently. The primary code of conduct for a finder this effective and versatile is what its sole manufacturer recommends. The markings of any finder is unique to its instruction book. So as you continue using a new sensor, you should be able to read the accurate markings for a studs’ location with the manual of the finder right by your side. You should know about the 3rd alternative technology behind this creation. With the help of microwave impulse radar, which is a cheaper substitute for stud finders, you get a larger and deeper scope of use. This kind of technology is licensed for inches to feet measurement. And it can also be implemented on steel reinforcements in buildings, walls, concrete pilings, etc. This kind of technology goes a few steps farther than wanting to hang a heavy-duty frame or mirror up on the wall. So the latter is safer for professional use while stud finders are best for everyone. Do you want to hang new frames up on your wall or a new set of shelves? While you may rely on the design of the wall to come to a decision, you need the stud finder to know that the studs are in any wall. The conventional, or non-stud finder, way to locate studs through walls was by using a tiny pivotal magnet or drilling a hole into the wall until you hit a stud. The former method of finding studs locates the nails that have been drilled into various studs. However, both of these conventional ways of finding studs is slow and often times ineffective. Modern stud finders detect the density of a wall to locate the exact position of studs. These are also known as capacitive finders that are capable of measuring 3-quarters of an inch in the wall’s density (thickness). Some models increase sensitivity to more than an inch for detecting the wall’s thickness and locating the studs. A safe way to use any capacitive finder is to read the manufacturer’s instruction book. So you can mark down the readings of the studs’ location easily. In most capacitive finders, the general reading of studs is at least 16-inches apart. However, walls house not only studs, but also pipes, wires, and other components. So if any other reading which lacks this kind of measurement may not be a stud at all. The anatomy of using the best stud finders is considered non-invasive and economical. So why shouldn’t you buy one right away for your apartment? What’s the difference between a stationary and moving detector? Stationary detectors, as the name suggests, are small magnets that detect all types of nails and screws in studs through a wall. You do not have to move the magnet finder around the wall for the detector to give you the exact location of the studs. Once you place the magnet on the wall, the strong magnetic force between the detector and the studs make the detector move in the exact source of the magnetic force. So, to put into simple words, stationary magnetic detectors use magnetic force and the magnetic attraction to move the finder to its exact location. Unless there are metal fasteners located in the wall, the effectiveness of magnetic stationary detectors is on point. This is common in plaster walls as they have metal fasteners that are located deep under the thick material. Most moving detectors offers a sturdy and reliable neodymium magnet which moves in response to a stud. Moving magnetic detectors are much stronger than stationary detectors as the former makes use of a rare earth magnet for effective operation. This means you can use a moving detectors on a wide range of construction sites. Once you place the detector on the wall, it moves in the direction of the magnetic force, which is the hidden metal. Plus, the finder moves very quickly, resulting in a distinct thud sound when it hits the wall and locates the stud. This makes it the best stud finder for plaster or tiled walls. Electronic Finders: Electronic finders are famous for their ease of use and precision. In fact, finding a wall stud with the help of an electronic finder is also the fastest way. An electronic finder uses the relative density of a wall to detect the nail. Once the studs are identified, the finder either releases a sound or lights up at the exact area of high density for the accurate measurement. Magnetic Finders: Magnetic finders are famous for their affordable price. They have been used, as conventional means to find nails, way before electronic tools were introduced. Making them the perfect alternative for getting basic tasks done. The reason why electronic finders work better than magnetic is because the latter is known for detecting pipes and wires through the wall. However, unless the magnetic tool registers a 16-inch marking from the center, it’s best for only detecting metal components, wires, and pipes in a wall. An exact 16-inch marking is only reserved for detecting studs, which a magnetic tool is efficient at doing. Instant Finders: Instant finders are the latest innovation with multiple sensor plates. To use an instant finder, you do not need to move it across the wall for quick detection. The technology of instant finders uses algorithms to register the accurate markings for the stud’s location. So using an instant tool for finding the stud’s location is applicable when you have uneven plaster, wall textures, or uneven paint to deal with. These are best for when you want to install a TV wall mount in a short amount of time. The top model we’re discussing is the Franklin Sensors ProSensor 710. It’s an electronic version that features multi-sense advanced technology. This means it has the ability to locate studs across many places on the wall. In that case, it’s best pick for large scale projects. Then comes the invaluable LED lights. They are bright enough to show you stud locations, which allows you to easily make accurate markings. Finding other hidden materials is also something that you can achieve with the finder. So you don’t have to indulge in unnecessary drilling through the plumbing and wiring. Once you put it to use, you won’t take time to realize how easy and convenient the tool is in terms of usability. On top of that, it’s faster, more accurate, and less prone to error than some of the other finders on the current market. So you don’t require professional carpentry experience to deal with something like this. The only thing that the Franklin Sensors ProSensor 710 lacks is consistent performance. After a few uses, it fails to provide results in a single try. So you might have to keep trying in order to get a proper reading. And this can be a little annoying to deal with. But in its defense, most stud finders, even the best ones, pose this kind of a problem. If you think one step ahead, then you might go for the Seek Thermal Compact Imager. This is a highly durable, versatile, and portable finder. The kind that you can plug into your phone. What the unique technology does is translate thermal energy into visible image. Such a function adds more convenience and versatility to your projects. What’s next is the broad 36-degree viewing field best for both outdoors and indoors. Outside, it lets you detect thermal energies that are as far as 1000 feet. Isn’t that impressive! The measurable temperature range of this thing is minus 40 degrees - 626 degrees. It does an excellent job at finding missing insulation, pinpointing the loss of energy, and detecting overheated circuitry. And these are only a few remarkable actions that the tool performs. It is equipped with focusable lens, which allows you to customize thermal imagery. What you also get is a waterproof, pocket-sized carrying case. So it’s safe to state that the Seek Thermal Compact Imager is an excellent choice for professional trades, contractors, structural auditors, and inspectors. Along with avid DIY homeowners! 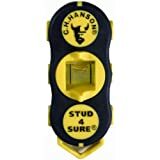 What’s so great about the CH Hanson 03040 Magnetic Stud Finder? The first noteworthy characteristic presents itself in the form of an affordable price tag. It’s quite surprising to find the best stud finder at such a budget-friendly rate. But there are other exceptional qualities to look forward to as well. For one, the highly useful finder is reliable and portable. All you have to do is slip it in your pocket without a worry. There’s no need to struggle with batteries either. The tool is packed with a phenomenal 2-way level. So making easy markings does not seem like an impossible or even difficult task to achieve. Furthermore, the accuracy that you get here is quite impressive. Even after a few uses, unlike some of the other products in the category. But what’s the most appealing is the ergonomic grips. These are incredibly helpful when it comes to prolonged use. Comfort is a factor that takes the front seat and don’t we all appreciate that! You might also value the presence of powerful magnetic force as it tends to facilitate hands-free measuring and marking. So you know that there’s a lot to expect from such a simple, trusted model. And for home or small-scale applications, you won’t find anything better in performance and more affordable in price than this particular pick. The Zircon StudSensor e50-FFP Stud Finder has worked for many people. It serves its purpose as the best stud finder. The only thing you will have to catch up on is its functionality. Once you get used to it, it can be of great help for a long time. In our testing, we found that once you detect its sound and red arrow, the stud through the wall lies at the edge of area between the letter “C” and the black triangle above it. That is where “ZIRCON” is labelled on the tool. If you wish to know where the stud ends, you need to rotate the stud finder and scan it backwards for an accurate reading. As for durability, it works longer than most battery-operated tools. What’s more? It fits well in your hand, pockets, or a small pouch. Which also means it’s a lightweight and portable tool for most users. The bottom line is that the Zircon quickly finds the studs and assigns well with the results it delivers. You can eliminate old ways to find studs through walls. You can make this tool a permanent part of your toolbox. We highly recommend it for remodeling. If you’re a DIY enthusiast, you might admire the functionality of the Studpop Magnetic Stud Finder. It a simple, no-fuss finder that performs the task of locating studs in the most efficient manner. It detects metal fasteners and activates the popper to guide you to the exact spot. We can’t stress enough on the fact the this tool does exactly the kind of action it claims to excel at. And that is to find studs, no matter what. You don’t have to deal with batteries here. On top of that, the finder works on different types of drywall surfaces, including lath, plaster, tile, and sheetrock. After conducting a thorough research, here’s something that we found. The product at hand is specifically crafted by professional and expert contractors. Plus, it is manufactured in the USA, which implies solid construction and maximum durability. When working with an appliance like this, all you demand is a quick way to locate the metal behind ceilings or walls. And that too without any fuss, right? In our opinion, you’re not asking for too much. So you deserve an option that works as flawlessly as this one. With the Zircon StudSensor 70 Center, expect nothing short of exceptional performance. When it comes to accuracy, this model is unbeatable on the current market. It features both deep and normal scan modes. The bright LED display, laser pointer, and tone alert are also remarkable inclusions. Time to elaborate! The Zircon StudSensor 70 Center easily and quickly locates metal pins and wooden edges behind ceilings, floors, and walls. The scanning modes, in particular, are the best part. Given that they make way for scanning more surfaces than any standard version. The LCD display offers easy readability. The pointer provides an arrow light to mark the target. The grip has an ergonomic design, which translates into a comfortable, solid hold in any hand. And at all angles! Next in line is the Wire Warning feature to detect unshielded, live wiring. The kind that’s as deep as two inches. And lastly, the unique technology that alerts you to begin scanning in new locations is also quite impressive. This is very useful in situations where you start scanning over the stud. In all, it ranks among the best models that have the ability to deliver accurate performance irrespective of potential challenges. For quick results, what you require is a high-tech finder. With that in mind, here’s the Precision Sensors ProFinder. This creation by ProFinder is what makes the process of metal-finding so much more convenient and quicker. And this is not just a claim; we found it to be true during testing. The advanced finder detects metal and wood under a wall. The innovative technology it’s equipped with helps in locking in hidden studs instantly. And that’s the best part of the majority of top-rated finders on the consumer market. Also, expect such superior performance not in one location but as many as 12 different locations. The display elements light up at such times, which goes to show how advanced this finder is in terms of usability. The fact that it works faster than the other models is the best part. It gives the product a competitive edge, doesn’t it? What’s more is that the there’s not much room for error. The manufacturer has made that possible. Even when accuracy comes into play, there are no disappointments to deal with. Thanks to the use of multiple sensors! Additionally, you also get integrated spirit level as well as ruler help. As a result of which you can achieve level-lined markings on your walls. So for prompt, spot-on scanning and sensing technology, choose nothing else but this. Allow me to introduce the Black & Decker SF100 Wood Stud Finder as the ultimate option for deep scanning purposes. It goes as far as 3-4 inches, which is the deepest until now. Plus, it’s comfortable and lightweight to use and hold. What’s even better is the visual, audible display. The kind that includes two durable AA batteries! The indispensable tool detects stud location like no other. You already know that. But what you might not probably be aware of is the compact size of the finder. The structure makes it possible for you to operate the thing only by moving it over the wall surface. Then comes in the LED lights, which light up accurately as soon as this best finder locates metal.These LED indicators are great for delivering accurate results. And such an action makes the process of stud-locating easier. Another thing that you might find extremely helpful is the addition of both visual and audio indicators. They work the best in a noisy environment or in areas where visibility tends to be problematic. So as long as compact design and easy usability are important factors, there’s no reason to not like the Black & Decker SF100. Finding the best multi-scanner finder is quite difficult. So we’re here to make it easier for you. 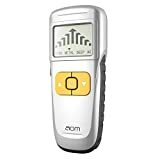 In this sub-category, it’s the AOM 4-in-1 Stud Finder that ranks the highest. And the reasons for its success are aplenty. Time to find out! The invaluable tool has the ability to locate edges of metal, wooden beams, AC wire, pipe, rebars, and joists. These can be present behind ceilings, floors, or walls, doesn’t matter. Another phenomenal feature is the depth setting of the finder. There’s the scan mode, metal mode, AC mode, and deep mode. They provide results as deep as 0.75 inches, 1.18 inches, 1.96 inches, and 1.49 inches respectively. What’s more? The addition of an excellent battery indicator and easy to view LCD. Such primary features make a vital piece of equipment like this suitable for both private and commercial applications. But before I move on to the last product, let me once again highlight the detection modes of this best finder. All four modes are specifically crafted to fit individual demands. Like the stud mode detects central and edges of beams, joists, and wood. The metal mode is more fitting for metal, rebars, copper, iron pipes, etc. The AC mode identifies live electric wires. And the deep mode is specially created to expose hard-to-reach areas. So this is what a multi-scanner is and should be capable of doing! The FOLAI Multi-Function Stud Finder is an option you can use without any difficulty, even as a beginner. That’s the best part about this finder. The multi-mode performance level brings tons of versatility into action. The finder detects metal, pipes, and AC wire as deep as three inches. There’s the LCD display and sound warning feature. You already know how useful a graphical, illuminated LCD display is. As for the latter, it is responsible for adding more convenience to the undertaking. Functionality-wise, this best finder quickly locates center and edges of metal, rebars, joists, and pipes. You can also use it to detect AC wires. Thanks to the inclusion of the phenomenal Wire Warning feature. In all, it’s the easiest to use finder that offers basic yet highly functional features. The kind that every best model is equipped with! The best finder can make a world of a difference between any successful DIY project and failure. When screwing or hammering things into floors, ceilings, and walls, it’s necessary to know what lies underneath. Otherwise, what happens is you end up damaging flooring or drywall with unsupported objects that you’re trying to fit. So choosing the best model should be priority #1. All the options discussed in the article perform the basic function in the most effective manner. They all detect support areas on the wall that contain joists and studs. And there’s not a single pick here that doesn’t offer more than just basic detection features suitable for only walls. You can even use them on ceilings and floors. At such times, take into account the type of project and material you’re dealing with. This way, you can select a finder that’s suitable for your particular needs and requirements. I would also like to add that the best finder is one that helps in not only locating but also marking framing studs under the wall surface. When you have such an indispensable tool at your disposal, you can subject it to both home and professional applications. We tested both magnetic and electronic models. And this is what we found. The latter work by identifying wall density. Such a version also includes AC detectors, different levels, and multi-scanning functionality. On the other hand, magnetic finders have a straightforward design. They detect wood studs simply by catching the presence of metal fasteners located on these tiny findings. Nevertheless, it’s the electronic finder that ranks the highest in terms of performance. And you have enough reasons discussed in the reviews section to believe so, don’t you? Q. How do I calibrate my stud finder?A. Some stud finders require you to calibrate for effective performance, right before use. Here’s a simple run-down of calibrating a new finder for the first time. Step 1: Press the finder against the wall and switch the stud finder on. The only way detectors work is by measuring the density (thickness) of the wall for location the exact position of the studs. Keep in mind that if you fail to press the back of the sensor against the wall to turn it on, it will calibrate inaccurately. Make sure the finder is firmly up against the wall during calibration. Step 2: This sums up the calibration cycle of the finder. However, the time taken to finish calibration differs based on the build and brand of the detector. For that, you will have to read the instructions book for a clear time estimate for calibration. Step 3: As soon as the calibration process is complete, you will see a bright “ready” light notification on the finder. This means the finder is ready to go. It may also be that your stud finder emits a beeping sound to notify you that the calibration process is complete. You must hold the finder to the wall until it’s ready to use. Such finders need to be calibrated each time before use. Q. What’s the difference between the edge and the center for detecting studs? A. Which type of a finder do you want? One that is an edge finder or a center finder? This is important to know because with an edge finder, you can mark the edges of the stud to measure its exact center. Meanwhile, with a center finder, you measure the center of the stud along with its edges. This is a common misstep that most homeowners make when buying the best stud finder. They mark only a single edge measurement of the stud. As a result, you end up drilling a hole toward the edge of the stud and not at the center of it for a best fit. This can happen in any room including the bedroom, kitchen, or living room. Q. Can my stud finder locate both wood and metal studs?A. Only a multiscanner is capable of locating wood and metal studs. Steel studs are more common than wood; the reason being that with the latter you have to deal with splitting and cracking. Plus, wood is prone to attracting all kinds of termites and mold, while steel is often immune to such fallacies. Similarly, steel studs won’t catch on fire so they’re impervious to all kinds of damages. As for the detection of both the materials, using a multiscanner is the best power tool for the job. You can switch the modes from metal to wood with the click of a button. It’s that simple and effective. Modern houses, especially those that are much newer come with metal studs that are often framed. However, there isn’t a significant difference between the size of a wooden tool than that of a metal one. But hanging on wooden studs is much more complicated than metal. For example, certain precautions needs to be taken when using wooden studs. If you wish to hang a heavy frame, drilled a metal sheet screw beforehand is necessary. This predrilled hole, which would be slightly smaller than the metal screw, functions as a self-drilling metal screw for safekeeping and stability. So installing heavier items such as big objects, mirrors, frames, etc. You can then install the object directly into the metal screw, from the mini drill end easily. On an ending note, taking care of metal and wooden studs is not an easy thing to do, unless you are well-equipped with a high-quality stud finder. This will keep you up-to-date about what works for your home’s structure and what doesn’t. And while this is important, a power tool always keeps you handy and ready for any emergency, if it may happen without any forewarning. As for the best of the best pick, the token goes to the Franklin Sensors ProSensor 710. This pick has all the features you’d want from the best finder. If you have used an older version of a sensor detector before, this one will surely feel like an upgraded pick. With a durable design, it’s meant for efficient work whether handled by a homeowner or a professional. This is best enough for anyone looking to hang shelves, heavy pictures, or mirrors in their room. And it’s definitely a step-ahead from the competition in terms of price. With that out of the way, you should trust our findings because we have spent a decent amount of time research the best picks for you. With the amount of knowledge we’ve harnessed over the days for locating all kinds of studs and nails, we know what makes a best electronic and magnetic stud finder. Along with the best picks, you will also understand the basic tips and tricks of using one. So you know why using a stud finder is so important in this day and age. It can be said that you might need a sensor this effective and accurate for a lot of reasons. And having to rely on just knocking on the walls to make sure it’s not hollow is not enough.